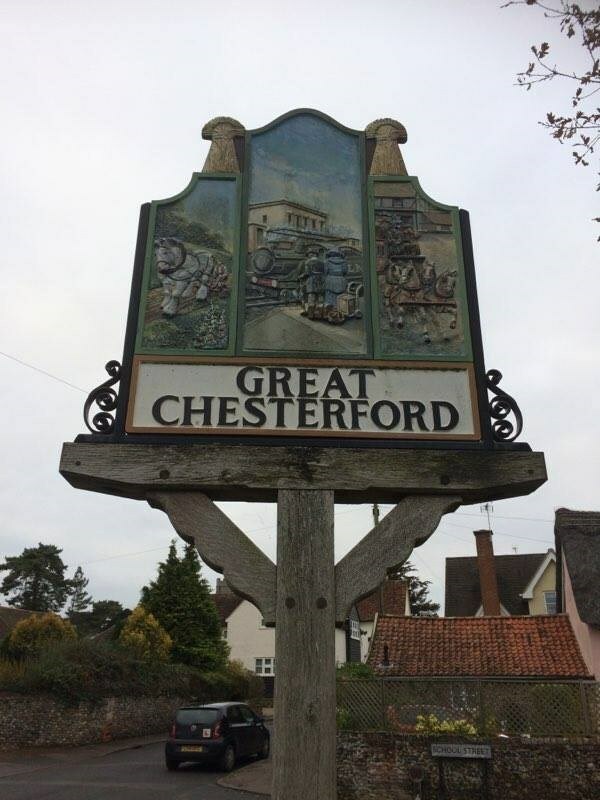 Great Chesterford is a medium-sized village and civil parish in the Uttlesford district of Essex, England. It is located 18 miles north of Bishop's Stortford, 12 miles south of Cambridge and about 41 miles north of London. The land around Great Chesterford has been inhabited for centuries, and there have been many archaeological finds e.g. Bronze Age beakers, Belgic pottery and jewellery, and many Roman artefacts which can be found in nearby museums. In the 1st century AD, a Romano-British civil settlement was established near the river, occupying an important site en route between London, Cambridge and Newmarket. They erected many buildings, including a tax office, and a temple which was excavated to the east of the town near the Belgic cemetery. In the 4th century the Romans built a wall around the town – remains have been found and its exact location is known. Take a look at the village sign. Just above the plinth is some black metal holding the wood in place, how many bolts are there in the black metal? Call this A.
Divide that number by two and you will get B. Double the number of A and you will get C.